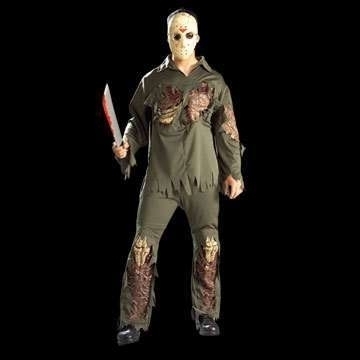 We will send an email to as soon as the product Jason Voorhees super deluxe costume is available. Adult costume includes green tattered shirt with collar and vinyl muscle and bone components protruding through the fabric on the chest, down the arm and at the top of the back with a tattered finish. Costume also includes matching green trousers with realistic looking vinyl bone pieces down the front of both legs and on the rear of the right leg and a tattered finish to the bottom. The costume includes an EVA hockey mask with elasticated straps to hold it in place. Add our official licensed Jason machete and gloves to create the pictured look.